I decided to give Dervel’s method a try and also keep track of how much time and money each tree cost. The trees took me about fifteen minutes each to construct, after the first one I found my rhythm and they became much easier. I primed them black and painted them up in greens and browns, so maybe twenty-five minutes each all told. One tree I painted in base greens and browns then dipped into Bombay Black polyurethane stain and let sit over night before matt-spraying and applying the green highlights. The one in the center (above) and left (below) was dipped then highlighted. *The paints, flocking, primer and matt spray were not included as they get used on many projects. 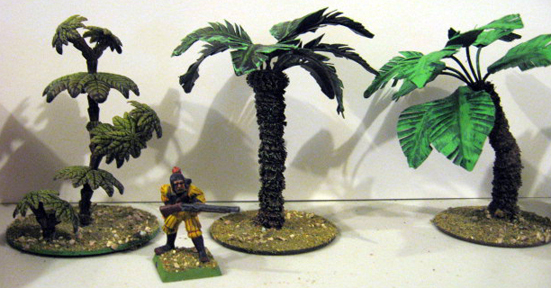 The GW plastic trees cost me $10.00 for a pack of four, $2.50 each. However, they’re out of production and unavailable, so their cost can’t be seriously compared to the home-builts. My thanks to Dervel of TMP for a well-done Workbench article. 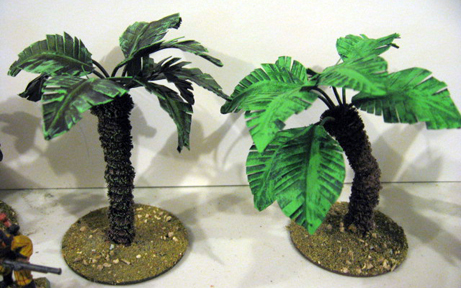 This entry was posted in Painting, Terrain and tagged Tree on April 21, 2013 by squirmydad.